Es entrar en el Mesón Botafumeiro y viajar instantáneamente a Galicia. Este restaurante se encuentra en el centro de Granada, muy cerca de la plaza del Carmen, y es el hermano pequeño de otro gallego de la ciudad, El Fogón de Galicia. Los platos estrella de la carta tienen un mismo protagonista, el pulpo. Así que si quieres acertar seguro prueba el Pulpo a la gallega o el Arroz caldoso de pulpo. No desmerecen para nada otras opciones como las Puntas de solomillo a la pimienta o el Arroz con bogavante. Y de postre, pionono. ¡Sin dudarlo! Si todo esto lo riegas con un buen Ribeiro, la velada será perfecta. 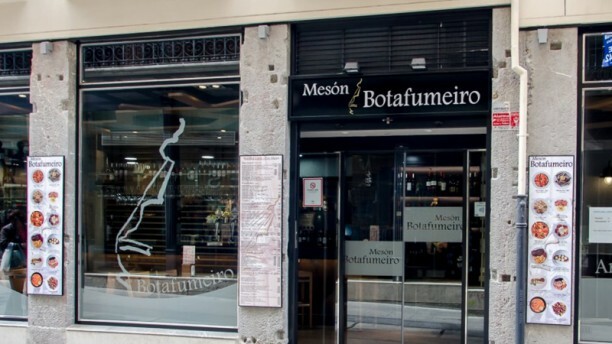 La mejor cocina gallega de Granada tiene un nombre, Mesón Botafumeiro, y seguro que tú ya estás deseando salir a probarla. ¡A qué estás esperando? It’s a good restaurant, the waiters are really kind, the food choice was huge but the food was just average good. Good restaurant! We eat a lot choosing the menu formula. Everything was good, but we found out that the drinks were an "extra". Food was delicious, fresh and plentiful. Our server, Lenis, was very nice. Food was excellent and portions were really generous. Staff were very friendly and there was a nice atmosphere. Will definitely go back again. Local moderno, céntrico, amplia carta, la lubima exquisita la ensalada Cesar abundante lechuga escasos ingredientes. Pero muy bien en general. Buena atencion recibida. Warm, modern and very clean restaurant. Very gentile staff and careful service. Pleasant and relaxed atmosphere. We ordered pulpo a la gallega and calamaro a la plancia: both exquisite! Really recommended! While the service was good and the restaurant is presentable, the food was really disappointing. We ordered the VEAL ENTRECOTE which was tough, like chewing on leather. Also ordered the MIXED GRILL (ASSORTED MEATS) which were served in different levels of doneness with some well done, some medium and some just RAW. I've never had raw chicken before and was not going to attempt it while traveling. To sum it up, the cooking really needs serious improvement. For the price (even with discount), it is just not worth it. A really good restaurant with a good food. worst whole lobster ever (was supposed to be grilled, but came whole; mushy, probably pre-frozen). fried eggplant terrible, thick batter, tasteless. (I was hoping for Italian-style eggplant) Did not help that the wait staff could not speak English. Grilled squid OK. chocolate ice cream NOT like the delicious gelatin down the road.